An Italian import. Previously confused with the older Aussie Amplivox. Farfisa produced a range of organs and electronic piano accordions such as the Transicord. Many of their creations feature bold Italian styling and colours, some of which is very bold and “sixties”, and others like this example, more timelessly elegant. This is not specifically a guitar amp, but rather a more general-purpose amp for band work, as we'll see. Three channels are provided, “I - Accordion” with volume, treble and bass, (top left); “II - Guitar” with volume and bass, middle and treble boost preset switches (lower left); “III - Mike” with volume and tone (upper right); and a “Tape-Phono” connector (lower right). Also lower right are the tremolo speed and depth controls and the footswitch connector. Everything is marked in English and Italian. This rig is apparently quite clean and may have been intended for small venues where it may have been used for two instruments and vocal all at once without too much intermodulation. The unknown Amplivox case is - A Farfisa 8. I have had confirmation from Italy with pictures. 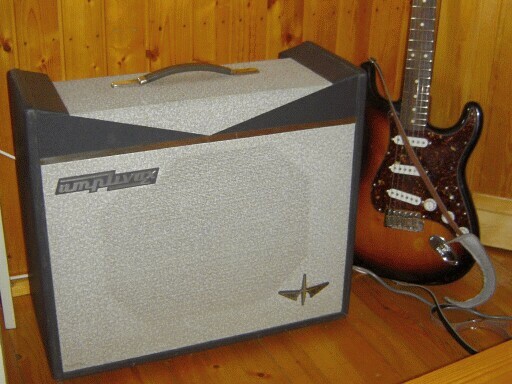 That solves the identity problem of that case, but what about Amplivox?? 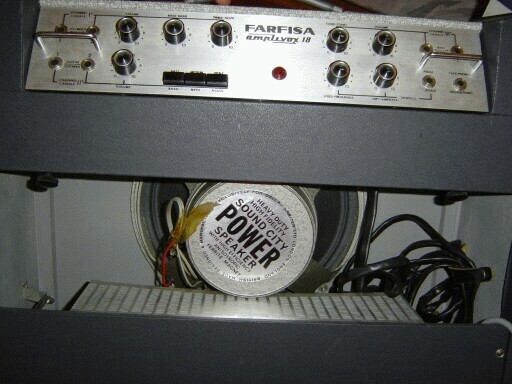 These Farfisa amps were sold as Farfisa 8 in Europe, and in the US as Cordivox by Chicago Musical Instruments. Was Amplivox the Australian Amplivox or just something someone brought in??? ?